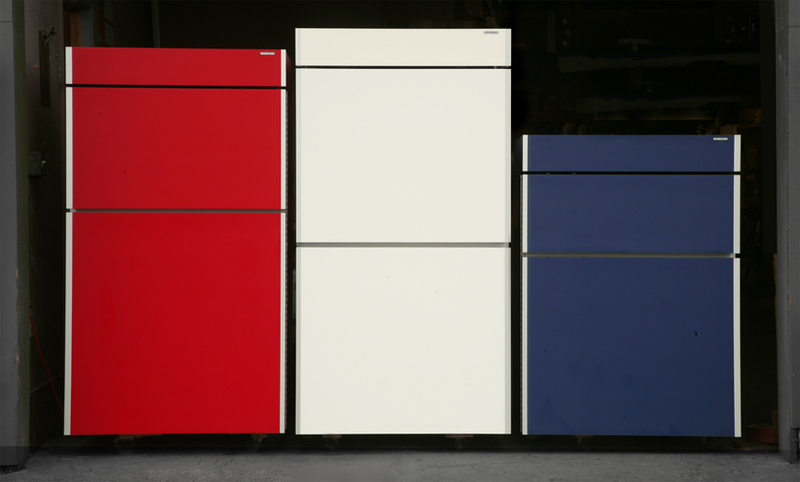 The worlds most elegant refrigerators are also the world's most efficient! Sun Frost Refrigerators are Made in U.S.A.! For power outages, we can equip your Sun Frost refrigerator with a non-interruptible power supply! Sun Frost participates in the U.S. government ENERGY STAR® program. Visit the ENERGY STAR web site at http://www.energystar.gov. In addition to unrivaled energy efficiency, Sun Frost offers amenities not found in conventional refrigerators, such as high humidity, food-saving storage, ultra-quiet operation and an easy-to-clean interior. Every Sun Frost is custom crafted - you choose the hinge side and finish. Your Sun Frost can be finished with a number of laminate or wood finishes. We are now also offering a stainless steel option. Ask us! 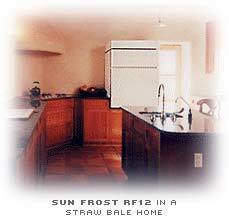 Please use the links below to find out more about Sun Frost refrigerators. The Sun Frost refrigerator employs an array of important innovations to achieve its exceptionally low energy consumption. The cooling system on the Sun Frost is top mounted. This reduces energy consumption several ways. The heat generated by the compressor and condenser (black coils on the back of many refrigerators) does not reenter the refrigerator, and with a cooler-running condenser the efficiency of the cooling system is increased. The condensers on Sun Frost refrigerators and freezers are cooled passively, except our RF19 and F19 models, which use a quiet and highly efficient fan to help cool the condenser. Because of the efficient design of the Sun Frost, the compressors used run less often, are much smaller and produce correspondingly less noise than those found on a conventional refrigerator. These features make the Sun Frost much quieter than a conventional AC refrigerator. Defrosting a Sun Frost is a simple process. Frost build-up in the Sun Frost freezer is very slow because there is no air circulating between the freezer and refrigerator sections. The ice that forms in the freezer collects primarily on the ceiling. When defrosting the freezer section, the contents of the freezer may be transferred to the refrigerator section so they remain frozen. After the refrigerator has been turned off for about twenty minutes, the ice is easily removed in large pieces. There is no mop-up because the ice does not need to be melted, only separated from the flat ceiling. Sun Frost refrigerators keep food fresher by maintaining high humidity. This prevents freezer burn and wilting caused by water loss. In a SUN FROST, foods often last two to three times longer than in conventional refrigerators. In typical refrigerators, the water contained in food is transformed into ice on the freezer's cooling coils. This process results in the dehydration of fruits and vegetables, increases energy consumption, and accelerates frost buildup. In a conventional refrigerator, high humidity is achieved by storing food in airtight containers, which creates high humidity conditions, but cuts off the foods' oxygen supply. Without oxygen, plant cells break down anaerobically, decreasing shelf life. The Sun Frost allows you to store produce in breathable containers, which considerably lengthens its shelf life. The SUN FROST RF16 typically consumes 15 KWH per month. By contrast, the average refrigerator in a home consumes 75 KWH per month. Producing the 75 KWH needed to run this refrigerator in an off-grid solar power system would require an initial investment of at least $4,500 in hardware. The SUN FROST would require a $500 investment. The cooling system of the Sun Frost refrigerator contains a minimal number of moving parts. Both the DC and AC compressors incorporate highly reliable, hermetically sealed, brushless motors. The efficient thermal design of Sun Frost refrigerators also contributes to their reliability. The top-mounted cooling system runs at a lower temperature than most, which prolongs the life of the system's lubricants and reduces mechanical strain on the compressor. The cooling system has proved itself to typically provide over twenty-five years of trouble free operation. During the summer, a typical refrigerator adds as much heat to your kitchen as a 1000 watt heater running four hours per day! The energy needed by your air conditioner to remove this excess heat will be about half the energy consumed by your refrigerator. Increasing the cost of running your refrigerator by an additional 50%. By producing much less waste heat than a conventional refrigerator, a Sun Frost makes your kitchen more comfortable and reduces the cost of air-conditioning your home. 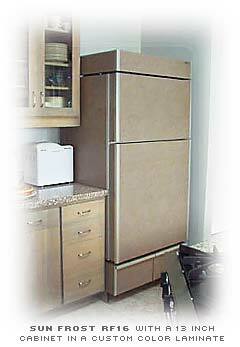 Sun Frost refrigerators are designed to be mounted on a cabinet. 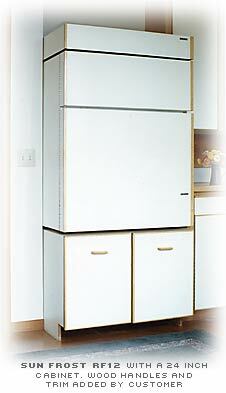 With the refrigerator raised, all stored food will then be at a convenient height. In addition, a cabinet beneath the refrigerator provides much more accessible storage space than a ceiling mounted cabinet. The cabinet could be built by the homeowner to match other kitchen cabinets or supplied by Sun Frost. Sun Frost manufactures a 13-inch high cabinet for the Sun Frost RF16 and RF19 refrigerators and a 24-inch high cabinet for the Sun Frost RF12. Each cabinet has two large side-by-side drawers. 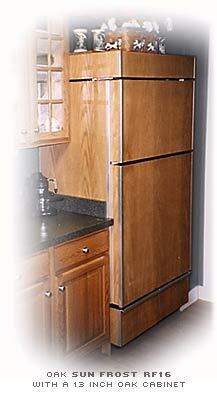 A Sun Frost refrigerator can be placed against a wall, minimizing the refrigerators footprint. It does not have to be moved for cleaning or servicing. 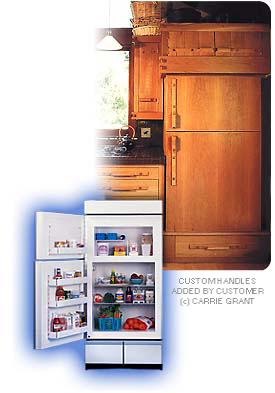 Sun Frost refrigerators and freezers are ideal for use in boats, RVs and conversion buses. All Sun Frost refrigerators are completely rust-proof. 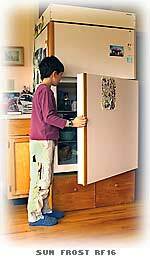 There is no need to level the refrigerator, and vibration will not affect its operation. Sun Frost refrigerators can also run directly off of batteries, so no generator is necessary. Each custom built Sun Frost refrigerator is available in more than 100 colors of high-pressure laminate and many natural wood finishes. The spacious interior, made from sturdy fiberglass-reinforced plastic, is exceptionally easy to clean, with no exposed ducts, tubing or inaccessible corners. The adjustable door shelves can accommodate half-gallon beverage containers, while adjustable glass shelves line the refrigerator section. Ask us about our new stainless steel option!